Coconut wraps sound like something that could either be a food product or a beauty product, don’t you think? Fortunately for all of us who love to eat, I’m talking about food. But before you get too excited, I’m not exactly giving you recipes, just meal ideas. More often than not, the way I eat is far too simple to require a recipe or I just kinda wing it. But I’m happy to tell you what results from my winging it! I am a huge fan of Nuco Coconut Wraps. Interestingly, I’m not a big fan of wraps or sandwiches in the traditional sense, but the flavor & versatility of these coconut wraps is pretty awesome! Here’s the scoop with these wraps (at least the Nuco brand ones): they don’t contain any gluten or grains. Though I wouldn’t eat anything just because of the ingredients, (it’s gotta taste good, ya know?) I do love that the only ingredients in these wraps are coconut meat, coconut water & coconut oil. For inquiring minds: each wrap contains 6 grams of carbs, 2 of which are fiber and the rest of which are naturally occurring in the coconut. The wraps have a touch of sweetness to them. You could absolutely use them to make sandwiches/wraps but since I’m not a fan of that to begin with, I use them in a few other ways that I thought I’d share with you guys. Though my breakfast/brunch of choice remains my famous cabbage salad bowl, sometimes I don’t have the ingredients on hand or I want to switch it up. Enter the breakfast burrito. Just the other day I shared this on Instagram and got a dozen or more questions about the wrap. First, I cook the bacon* in a skillet. When the bacon is nice & crispy, I set it on a plate and immediately add the eggs to the pan in which the bacon cooked. (If I am making more than a couple slices of bacon, I’ll pour off some of the fat first.) 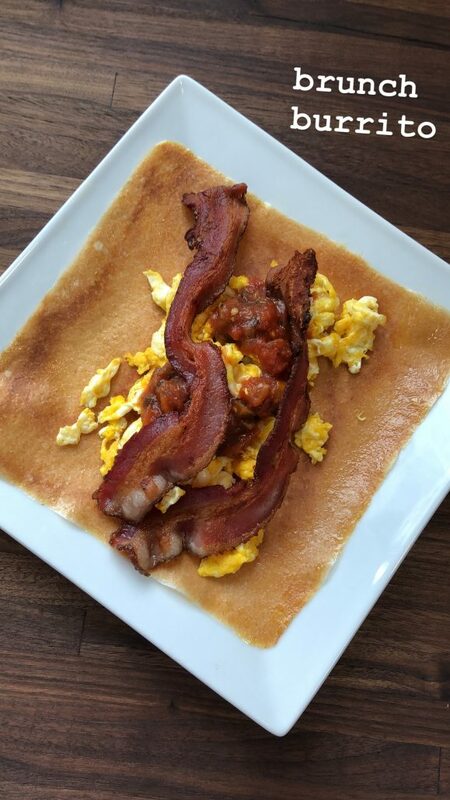 I like to add a spicy element to the eggs – either a hot salsa (as was the case in the above picture) or I’ll put some Primal Kitchen Chipotle Lime Mayo on the wrap. *Of course you can omit the bacon. You can make it however you’d like. Recently, I started getting my bacon (with no sugar or nitrates) from Butcher Box & I absolutely love it. After the eggs are done, I’ll remove them from the pan & put the wrap in it’s place, allowing it to warm up on low heat for about 15 seconds on each side. I’m not trying to cook the wrap, just soften it a little bit. Otherwise it’ll be kinda chewy. After it’s warm, I put it all together. Voila. See? No recipe really needed. I recently did this with leftover steak (steak & egg burrito) and it was super delish! Let me first say that I do try to limit dairy. I feel better, I’m less bloated and my skin is more clear when I’m eating less dairy rather than more. But I do love cheese and eat it every once in a while. For more on my perspective on dairy, take a listen to episode 128 of the Primal Potential podcast. Quesadillas are quick, easy, inexpensive and super delicious. In fact, as I write this, I’m mentally planning the next one I’m gonna make…. I’ll cook up some peppers, onions and steak like I’m going to have fajitas (you could also easily do this with dinner leftovers after Mexican!) and I’ll toss it inside two wraps with some pepperjack cheese. These wraps can burn pretty quickly, so you’ve gotta go low & slow when heating them, okay? I’m thinking about 3 minutes on each side over low heat, but it’ll really depend on your pan & how much stuff you put inside. Either way, crazy tasty. If you’re following me on Instagram, you’ll probably see this one show up in my stories sooner than later! I don’t know about you, but I could effortlessly eat a couple baskets of chips & salsa or queso. Thankfully I don’t anymore (pretty sure I’ve hit my lifetime quota of tortilla chips) but I certainly could. Sometimes I really want that combination of crunchy, salty and creamy in a way that carrots or celery doesn’t reallly satisfy. Let me first acknowledge that this is what makes me a bad blogger. I could have a recipe but I don’t. Maybe I will change that, we’ll see. But my style is really to put something in the oven and watch what happens. Here’s the great news about that: I believe that we overcomplicate cooking. We think we need to know exactly how to do something before we’ll try. WRONG. Just get in the game and see what turns out! Here’s how this creation started: I burned a wrap. It was flakey & crunchy like a chip, which wasn’t what I was going for but certainly a happy accident. So, I cut the wraps into pieces and put the pieces on a sheet pan in a 400 degree oven. I watched them bubble and pulled them as soon as they started to brown. It only took a couple minutes. I made 2 wraps worth, which was great, because I could have easily eaten more. They were super tasty dipped in guacamole! There are other flavors of the wraps, but I’m a big fan of the original (plain) flavor. I haven’t tried the turmeric or the cinnamon but I totally added them to my cart while I was writing this post! I bet they are AMAZING (and of course I’ll let you know). The cinnnamon flavor doesn’t have sugar added, just cinnamon, so I’m pretty pumped about that. Make sure you’re following me on Instagram to see what I do with those ones when they arrive! If you want to give them a try, I’m a big fan of the Nuco brand and I get them through Thrive Market because they’re cheaper there. There are 5 in each pack & they keep well in the fridge for a few weeks so I buy a couple packs at a time. You can save an extra 25% & get free shipping on your first order + a 30-day trial membership if you register through thrivemarket.com/primalpotential. Do you think i could use these like a wonton wrapper? I am DYING to make a low carb version of crab rangoon! They might be a little thick for that. I’m not sure how they’d fry, but only one way to find out! Let me know if you give it a shot! YUM! Thank you so much, just bought some and an enjoying the versatility. BTW; heated one gently, coated it with butter, swerve and cinnamon. Great replacement for toast. Am looking forward to using it as a crepe.